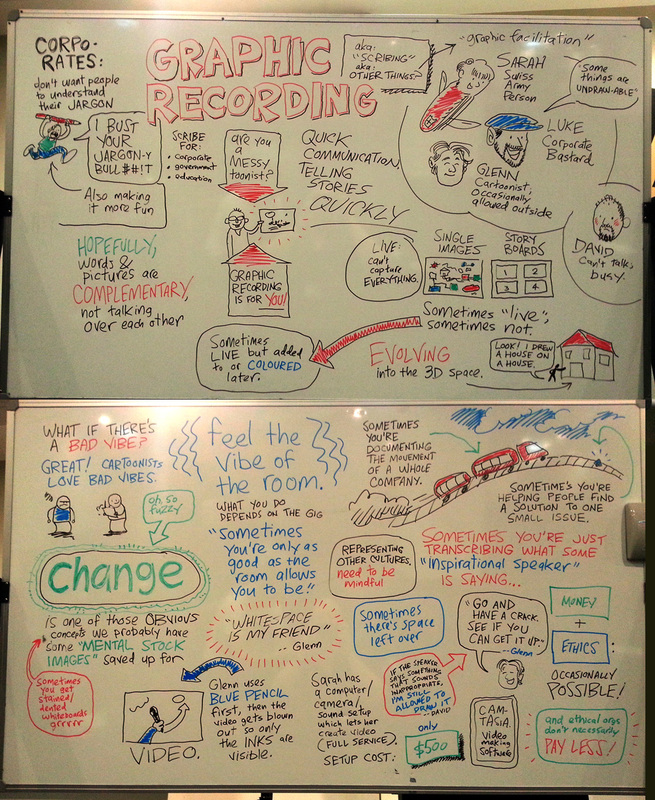 “Scribing”, otherwise known as “graphic recording”, “graphic facilitation”, etc, is where an event is captured, often in real time, by an artist using words and pictures. You can be employed to do this, though I often do it on paper for my own benefit at conferences or talks I attend. This year I’ve had more work in this field, so I was asked to speak on a “Graphic Recording” panel at the Australian Cartoonists Association’s Stanleys Conference this past weekend. Because I’m less expert at it than the other participants (Sarah Firth, Luke Watson and Glen Le Lievre), I asked if I could just scribe the panel itself rather than speak. This was the result! Hopefully you get an idea of the content of the panel, which was really well received. The very funny Peter Berner came up and asked me some questions about it afterwards, so hopefully we’ll be seeing him doing some scribing soon (he’d be uniquely well-equipped for it)!